Mainly about reading with an accent on intelligent crime fiction from around the world. Madeline Dare comes from an old-money family, money that is so old that there is none left, as she puts it. Her parents divorced when she was young, so she was bought up in California, then New York. Now, however, she’s met the love of her life, Dean, married him and lives with him in Syracuse, upstate New York, circa 1988. Dean is obsessed with his plans to create an automatic method of grinding rail tracks, so is almost always away. Madeline is bored out of her mind, her only real distraction being a part-time job at the local newspaper, writing humorous foodie columns. This is a book that is replete with local colour and observations of the American way of life. Dean comes from a family of farmers, so the reader is treated to descriptions of the contrasting lifestyles of the hardworking, redneck, uncultured in-laws, with the brittle world of the socially superior yet largely empty-headed relatives of Madeline. Dean’s brother casually reveals that he’s discovered some dog tags while ploughing up a field. The site is where two young women were murdered 19 years ago, in 1969. The murderer was never found. Madeline is shocked to see that the dogtags belong to her favourite cousin Lapthorne, on whom she had a teenage crush, from around the time he was drafted to Vietnam. She determines to prove his innocence by investigating the crime herself, using Dean’s family connections and her own newspaper contacts in the process. The tale is told at an extremely leisurely pace, with many observations of small-town life seen filtered through Madeline’s humorously sarcastic perspective – also applied to her family. She spends an inordinate amount of time missing Dean, who is rather a colourless, if handsome, character. This repetitive theme becomes a tiresome aspect of the book. Half way through the book, Madeline comes across some evidence that exonerates her cousin, so she goes public with her intention to solve the crime. This decision rapidly stimulates some nasty events which hastily lead to a conclusion that echoes the opening page of the novel. 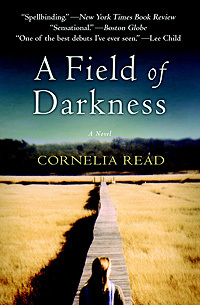 The main pleasures of A Field of Darkness are its detailed, well-written portrait of Syracuse, a decaying community; and the character of Madeline, who is both distinctive and who has an interesting selection of friends and relatives whom we come to meet during the book. As a crime novel, the pace is too slow and there is a dearth of suspects, even though the ending is quite chilling. I bought this book. It was nominated for the Edgar award for best first novel. Read other reviews of it at: Bookreporter, Oprah (who selected the novel as one of her summer’s picks), Spinetingler and MBTB’s mystery book blog. Author’s website, where there are free excerpts and Q/As about this book and the next two in the series. This entry was posted in Book review by Maxine. Bookmark the permalink. Thanks Maxine, from your review it does sound attractive to me, I’ll take it into account. I liked this book. I very much enjoyed Cornelia Read’s sense of humor about Madeleine Dare’s formerly wealthy but arrogant and snobby relatives. The author has a family background similar to Madeleine’s and has a great wit when talking about them. I can’t wait to read the fourth book in the series, at some time in 2015 when the TBR pile has decreased. Maxine – Thanks as ever for the excellent review. It sounds as though this novel has at least as much focus on the personalities and interactions of the characters as it does on the crime. And the setting interests me greatly; New York is much more than just New York City and I like it when an author explores an area or a group of people that don’t generally get a lot of fictional attention. Interesting review. I wouldn’t have picked up the book as I don’t like the cover although the fact it has been nominated for an Edgar is interesting. There seem to be a lot of this type of book around at the moment – slow paced thrillers with missing people/discovered bodies. I would quote you the titles but virtually every one for me was a DNF and has gone to charity. Agree, Sarah. This one was written in 2006, and I think it is very well written (certainly compared with your average crime novel), with a great sense of place. But I did find the actual crime plot a bit standard (& too many coincidences, eg the discovery of the dog tags by Madeline’s in-law) and far too drawn out. I think the author was less interested in the crime bit than all the other elements (characterisation, location, back-story etc). I did like this book, and some of her others, but I’d agree that the detection element is not as good as the characters. I sometimes think you can spot a writer who has come to crime stories without a huge background in reading them, do you know what I mean? They use strategies and deceptions and coincidences which make an experienced reader wince a little… but I can forgive them some of that if it’s well-written, which I thought this one was. Yes, Moira, I agree. I often find that when one reads a “book with a crime in it by someone who does not read/write crime fiction” – what is presented as a surprise is often a very well-known genre staple. But I also agree that this book is well-written. Petrona by Maxine Clarke is licensed under a Creative Commons Attribution-NonCommercial-NoDerivs 3.0 Unported License.